At Liquid Latex Fashions.com you will find the only Ammonia-Free Liquid Latex Body Paint. Our special formulation includes FDA approved ingredients that is safe for use on the face and body. One of the most remarkable things about Liquid Latex Fashions Latex Body Paint is that it dries at room temperature and forms a highly elastic rubber. When you're done just peel it off! Our basecoat and body paint is also safe to use on children. 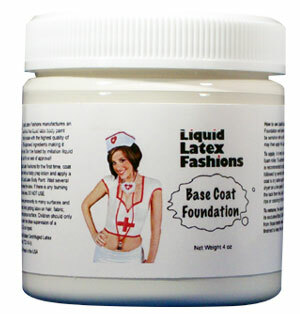 We reccomend using the Liquid Latex Base Coat for best results. Apply to the area you will be painting and let dry. Paint color ontop of basecoat for bright, shiny, and flawless color.